Cardiac catheterization —the insertion of a tube-like instrument into the heart through an artery to detect problems with the heart and its blood supply. It can also accurately define the valve problem. General anesthesia will be used. It will block any pain and keep you asleep through the surgery. It is given through an IV. The doctor will cut through the skin and breastbone. The chest cavity will be opened. Next, your heart will be connected to a heart-lung machine. This machine will take over the functions of the heart and lungs during the surgery. Next, the heart will be stopped. 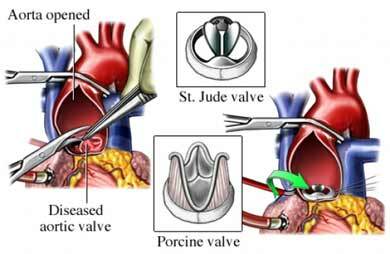 An incision will be made and the damaged valve will be removed. The new valve will be stitched into place. The doctor will check to make sure the valve opens and closes properly. The incision in the heart will be closed, and the heart will be restarted. After the heart is working fine, you will be removed from the heart-lung machine. The chest will be closed with wires. Lastly, the skin will be closed with sutures. You will have pain while recovering. Your doctor will give you pain medication. This procedure is done in a hospital setting. The usual length of stay is 2-5 days. The first day is spent in ICU. You may need to stay longer if complications occur. Breathe deeply and cough 10-20 times every hour to help keep your lungs working well. Walk with assistance. You may be encouraged to walk 2-3 days after surgery. Take blood thinners to prevent blood clots from forming around the valve. If you have a tissue valve, you will not need a blood thinner. If you have a mechanical valve, you will have to take the medication for the rest of your life. Take medications to control pain or prevent blood clots. Care for the wound to prevent infection. Work with a physical therapist. Aortic valve replacement. Encyclopedia of Surgery website. Available at: http://www.surgeryencyclopedia.com/A-Ce/Aortic-Valve-Replacement.html. Accessed September 14, 2017. How is heart valve disease treated? National Heart, Lung, and Blood Institute website. Available at: https://www.nhlbi.nih.gov/health/health-topics/topics/hvd/treatment. Updated June 22, 2015. Accessed September 14, 2017. Mitral valve replacement. Encyclopedia of Surgery website. Available at: http://www.surgeryencyclopedia.com/La-Pa/Mitral-Valve-Replacement.html. Accessed September 14, 2017. Options for heart valve replacement. American Heart Association website. Available at: http://www.heart.org/HEARTORG/Conditions/More/HeartValveProblemsandDisease/Options-for-Heart-Valve-Replacement%5FUCM%5F450816%5FArticle.jsp#.WbrjLrKGNxA. Updated September 21, 2016. Accessed September 14, 2017.